Parking? No coins? No worries. 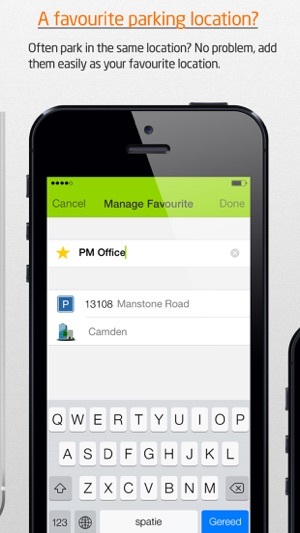 With Parkmobile you can pay for your parking using your iPhone and GPS location. 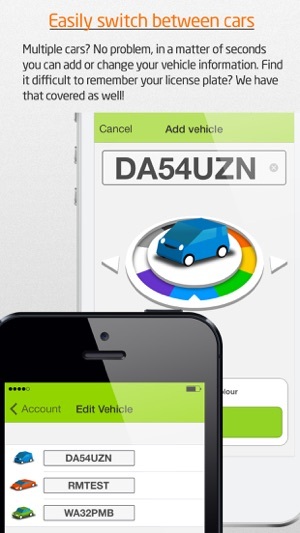 You can also manage your vehicles, add favourite parking zones, view your parking history and extend or stop your parking where permitted. To use this App you need to be a Parkmobile customer. You can register for a free account through the App. 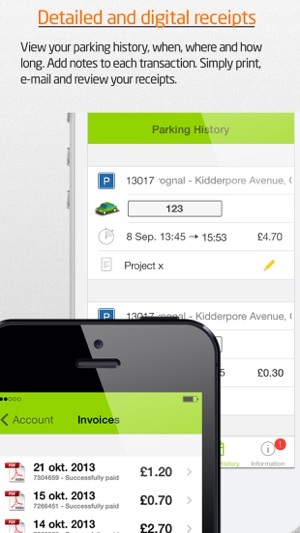 Paying for parking has never been easier. 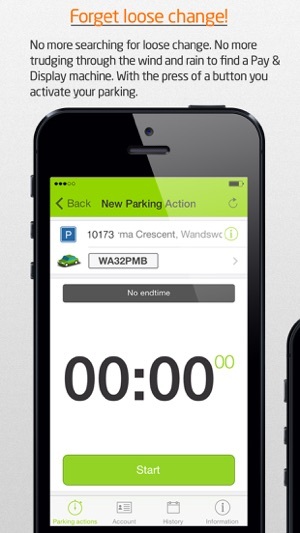 Parkmobile is the smart way to park! 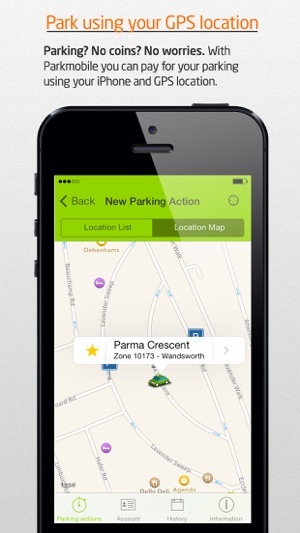 You can use the Parkmobile app in the Netherlands, Belgium and the United Kingdom. We freshened up the app with new colors, icons and a brand new Splash screen. I downloaded this app the pay for parking as a one off as the place (Brunel University) I was parking only accepted coins. Then I received an email with a bill for texts messages they sent me which I wasn't made aware of and didn't agree to and on top of that there was a surcharge for my “plan” which I wasn't aware of or agreed to and it has no expiry date so even if you never use the app again they will charge you .80p a month for as long as your card is valid! I then went to the website to cancel the account only to find out that you cant opt out via the website or by email THE ONLY WAY TO CANCEL TO CALL THEM AT 2P A MINUTE SO IT COSTS YOU TO CANCEL SOMETHING YOU NEVER AGREED TO! In response to the developers comment. The helpdesk email was nowhere to be found on the contact page or in FAQS and beyond that I didn't sign up via email, website or social media and all of those options are convoluted and a waste of time! I signed up via the app and I should be able to cancel via the app and ALL charges should be clearly explained before the sign up is confirmed! I use Ringo regularly and there are no hidden charges like sevice charges are charges for txt messages! This app is purposely designed to bilk you of small amounts of money for lots of hidden charges so that they go unnoticed when debited. Just looking at the number 1star ratings in here tells the real story! This app should be banned from the app store! Used the app for the first time today and it seemed to work fine. A couple of suggestions for improvement - it would be helpful to be able to search for the name of the car park or area (rather than just the car park number) which you won’t know until you’re there. The instructions could do be a little more detailed: It doesn’t say anywhere how long you have once you’ve pressed stop to get out of the car park (I used the Leeds Woodhouse Lane car park which didn’t have barriers so it wasn’t a problem); Also - do you need to leave the app running in the background and is it a problem if you close it? ; there were signs in the car park that a ticket must be displayed so suggest adding clarity on the app that this is not needed when using the app (may be obvious to some but there were warning signs all over the car park - it was only when passing a pay staton that this was clarified). Overall seems like a good app but a little basic. The sign up process tries to take your life history including blood type and what you had for breakfast 2 months and 3 days ago so if you’re in a rush, don’t use this. I was amazed at the archaic web sign-up form from the 1970s which as a developer I would have been shot for trying to fob off to my boss. It takes card details instead of just using apples pay api and doesn’t allow any SSO like google. Absolutely furious that I was forced to use such a poor excuse for an “app”. Also tries to rip you off by automatically charging you for texts they decide to send out. In any other situation I call that scamware or extortion. Just a quick tip devs: An app on a smartphone uses these special things called “push notifications”. The only settings in the app are for SMS or Email. You must have forgotten that we don’t live in the 90s anymore but there’s a little reminder. One thing I did like is the ability to extend the time without going back to the car, so that’s one good thing that makes me think at least one of these devs lives in the 21st century.